The Drudge Report runs with a banner headline, “Trump battles ghost of McCain,” with a link that takes the reader directly to an Associated Press report titled, “Trump aims new blasts at McCain, claims credit for funeral.” The AP, an integral cog in the vicious media anti-Trump machine, couldn’t convince a newly landed UFO pilot it was unbiased. Arizona Republicans knew the slippery senator all too well. He could never have won here dependent on the votes of Republicans alone or conservatives in particular. John McCain was reliant on newcomers who voted for the only name that was familiar, and the large retirement communities that dot the Grand Canyon state, who believed his self-inflated tales, disregarding or unaware of his checkered past and his role as the ringleader and most reprehensible of the those involved in Keating Five Five scandal that brought down other congressional careers. McCain returned from Vietnam where he was promptly dubbed “the songbird” by other American prisoners, for immediately giving up classified information (video). He quickly dumped his wife and family to marry the nearly two decades younger junior rodeo queen and beer heiress, Cindy Lou Hensley, in a lavish wedding within days of his divorce decree being issued. Her well-connected father paved McCain’s way into a U.S. House seat in the East Valley, where he served a single term, before moving back to Phoenix and running for the U.S. Senate. McCain had to be strongly persuaded by members of the then-powerful “Phoenix 40” that he could not run as the Democrat he preferred when initially looking to replace House Minority Leader John J. Rhodes, a man of integrity who easily won repeated reelections as Arizona’s first Republican congressman. Losing twice in his quest for the presidency, McCain despised and reviled President Trump for achieving for what he thought was his due and failed to win. As chairman of the Senate Armed Services Committee, he permanently sealed the records of Vietnam-era POWs and MIAs from their families — especially egregious since he was a POW himself. On the rare occasion he attended a statewide statutory AZ GOP meeting, he was greeted with boos, turned backs and walkouts by the elected delegates when he appeared onstage. In 2014, McCain was censured by elected state and county committeemen. After being diagnosed with brain cancer, McCain refused to step down from the senate for over a year, leaving his seat vacant until his death. Vile to the end, he cast this shocking last vote (video) against the “skinny” repeal of Obamacare…which he previously claimed to abhor. He then set about orchestrating his own three, week-long funerals and a list of those who would pointedly be disinvited, including President Trump and First Lady Melania. The President graciously accorded McCain full honors of lying in state. Access to Air Force Two was made available to McCain’s family to fly his body to Washington D.C.
Now its been verified that the vengeful and jealous McCain was key to the sordid hoax intended to bring down the candidacy of Donald Trump, and most assuredly keep him out of the White House. 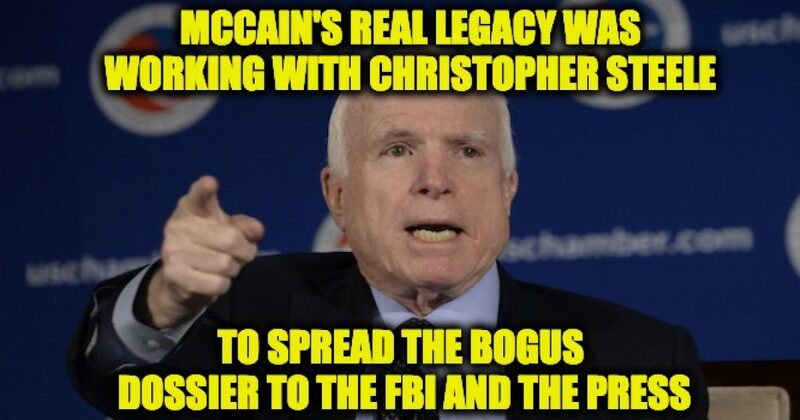 John McCain was integral to passing on the fraud created by operatives of political opponent Hillary Clinton, a close friend of McCain’s, during Trump’s presidential campaign, alleging that the Russians had compromising information on candidate Trump. McCain personally hand-carried the sleaze-laden documents to then-FBI Director James Comey in 2016. McCain also lied about his open border stance (campaign ad) during his senate race, claiming to want a “danged” border fence, when exactly the opposite was true. SRAZ has never been suckered by either McCain or his sycophantic syndicate who have conscientiously crafted a fabled character out of a conceited, vicious and foul-mouthed character, who was fortunate enough to be born into a family of naval admirals, affording him entry to the Naval Academy in Annapolis, where he graduated at the bottom of his class and went on to crash three jets. Death doesn’t make him any better and doesn’t alter the facts. Today, we provide the back story to the sordid hoax intended to bring down the candidacy of Donald Trump, and most assuredly keep him out of the White House. The vengeful and jealous John McCain was integral to passing on the fraud created by political opponents of Trump during his presidential campaign, alleging that the Russians had compromising information on the candidate. It was known at the time that McCain personally hand-carried the sleaze-laden documents to then-FBI Director James Comey in 2016. Yet as the salacious report exploded and dominated the news, McCain’s involvement mysteriously faded into the smutty haze. The syndicated game show Jeopardy! has been In the news recently after the debonair host Alex Trebek shockingly disclosed he’s been diagnosed with a stage 4 pancreatic malignancy. Longtime viewers of the popular quiz show will remember former contestant Matt Jackson, a young paralegal who had one of the long-running show’s most memorable winning streaks —- 13 episodes. The intellectually gifted 23-year-old was impossible not to cheer for. The Yale philosophy major never caught up with all-time winner Ken Jennings who topped out at a record 74 episodes in a row, but Jackson won $413,612. He recently appeared with other top winners participating in the All-Star Tournament. Wondering what this has to do with Paul Manafort, President Trump‘s former campaign manager who has been charged in connection with fraud unrelated to the campaign? Early in the show, Trebek asked Jackson to talk about his “very different” parents. Matt Jackson comes from an intellectual gene pool. Both of his parents are lawyers. His father is Washington, D. C. attorney Darryl Jackson, who served as a Commerce Department official under former President George W. Bush. His maternal grandfather, Barnett Berman, was a physician at Johns Hopkins University. Matt Jackson cited him as an early influence in becoming well-read. And Jackson’s mother — the woman her own son described as “liberal”? Barack Obama nominated Amy Berman Jackson as United States District Judge for the District of Columbia. She was confirmed by a 97–0 vote on March 17, 2011, and was commissioned the next day. The roll call vote can be seen here. Following their established pattern, Arizona Senators John McCain and Jon Kyl both voted to confirm the leftist nominee. It was Judge Jackson who added three-and-a-half years on top of the nearly four-year sentence Manafort received last week in a separate case in Virginia, though he’ll get credit for nine months already served. This is the statement the nearly 70-year-old delivered to the court prior to the sentence being handed down. It was met with an icy reception from Judge Amy Berman who said she was not satisfied with Manafort’s apology, accusing him of trying to avoid punishment. Today is Election Day in the City of Phoenix. It’s not just any election, mind you. It’s a Special Election — for mayor. The seat was left open when the former deeply committed mayor, Greg Stanton boogied to run for congress in Congressional District 9, following Kyrsten Sinema’s departure. On his way out the door, Stanton doled out $2.4 Mil of our tax dollars to a La Raza ally. When initially elected mayor, he received a congratulatory call from then-President Barack Obama and his Secretary of Homeland INsecurity, Janet Napolitano — clearly exposing the farce of “non-partisan” city elections. For her part, Sinema magically ran for, and was elected to, the U.S. Senate — without ever once mentioning her party affiliation. If you’re wondering about the election today, there’s not much to bother yourself with. Both candidates are Democrats. The only choice is the “conservative” liberal or the straight-up, liberal liberal. It’s all a disgraceful charade. Council District 5 and 8 seats are also on the ballot since those are the seats Valenzuela and Gallego abandoned. It does sound confusing, but just think of it as Democrat politics as usual. In this case Daniel Valenzuela has political operative friends who have been financing mailers that describe the firefighter unionist and committed liberal as a “conservative,” when nothing could be further from the truth. Moses Sanchez, who ran and lost claiming GOP credentials, has endorsed Valenzuela. He joins other AZ Republicrats Woods and Romley (appropriately at the bottom of the endorsement list) who have made careers of endorsing liberals. Woods recently made good on his longtime promise and re-registered as a Dem, losing his swag. Also among Valenzuela’s endorsers are McCain insiders Robert Delgado and Doug Yonko, both honchos in Cindy Hensley McCain’s Anheuser-Busch beer distributorship empire. Kate Gallego, who was the object of incendiary race-baiting when she ran for the city council seat she has abandoned for the mayor’s race, has the better credentials. She graduated Phi Beta Kappa from Harvard University and earned an MBA from the Wharton School of Business at the University of Pennsylvania — though her endorsements are as radically leftist as Valenzuela’s. Her ex-husband, U.S. Rep. Ruben Gallego, who she divorced while pregnant with their only child, has gallantly endorsed her candidacy for mayor. Arizona voters need a scorecard to keep up with the ambitious, reconfigured Democrats and their stranglehold on the city of Phoenix and encroachment on D.C. in the Senate and House. If you’re up for this, election results can be viewed here. We suggest you watch the on an empty stomach. Polls close at 7 PM. You are currently browsing the archives for the McStench category.